NATIONWIDE (BLACKNEWS.COM) — The Movie Black Panther made history and shattered records across the world. In fact, Black Panther became the highest-grossing MCU film of all time in its first week. The New York Times has called it a defining moment for Black America. 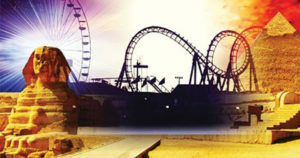 That defining moment has for a long time been the motivation for Heritage City – The African Kingdoms and Empires Theme Park Project pioneered by a group of Africans and African Americans under the umbrella of the Heritage City Group, which funded a business plan and conceptual designs for the project in 2004. Heritage City was designed to showcase Africa’s rich history and produce a total experience in learning and entertainment-all in one location. The theme park, initially planned for Africa’s most populous country, Nigeria, suffered significant delays due to corruption and bureaucratic bottlenecks. With the increasing popularity of Black Panther, the initiative is now attracting inquiries from potential developers not only in Africa but also for possible mult-iple locations in Europe, North America and China. Even though countries like Kenya, Senegal, Morocco and South Africa remain examples of tourism development in Africa, the appeal Heritage City comes from its uniqueness as a one-stop location that will showcase all of the continents’ diversity and bring to life themes from African movies, legends and folklore. The world of Wakanda in Black Panther is a mythical nation in Africa that has the world’s most advanced civiliza-tion, but Heritage City is pre-senting the real Africa that pio-neered scientific and astrono-mical discoveries in the Em-pire of Mali, built advanced ar-chitectural wonders such as the ancient Pyramids of Egypt and Nubia and whose Kings and Queens displayed so much splendor, wealth and intellec-tual sophistication. initiative and will be a cumu-lative showcase of the entire African continent’s history, cul-ture and entertainment in one spot.